The Days of Johann, an agility dog! : The sales are starting early this holiday season! The sales are starting early this holiday season! Looks like the sales are starting super early this holiday season, but I don't mind. We saw that Sears is having their Big One Day sale! Mum loves to go to Sears. Why? Because they have Lands End clothing, her absolute favorite clothing to wear for our dog activities. Whether it be running at agility trials, training in the backyard, or just a walk around the blog, they have amazingly warm coats, great pants to keep the rain off, wonder fleece to keep her toasty, and the best gloves, hats, and scarves anywhere in her opinion. Not only are they stylish but the price is right too. 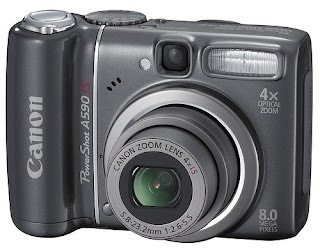 And we saw the Canon Powershot 8.0 megapixel 4X optical digital zoom still camera for only $149.99 before $30 instant savings - a fabulous price, and and good little camera for some pawsome dog shots. Lots of our agility buds have been asking about an inexpensive quick shot camera, this would be a good one with a great price. I own Canon cameras from the point and shoot all the way to the Digital SLR models and I have to say how pleased I am with the quality of the pictures. I own two Powershots and they are excellent enough where I leave my SLRs at home most of the time out of sheer convenience. I took a trip to Spain a year ago and left the SLR at home too. Which I never thought I'd do. The only shots that I find the feature rich (but still point and shoot) Powershots lacking in is for high speed sport action. Not that these cameras are even claiming that ability... the closest they come is the "kids and pets" preset. I love them so much, I even gave one as a wedding present. When the wife goes into labor and Dad still wants to catch the shot but doesn't have time to grab the 30 pounds of SLR camera... snag the Powershot on the way out the door and get beautiful photos and even ok video. Thanks for the review Chris. It will help lots of folks in deciding on a good camera. I agree with you on the action shot stuff. My little Canon isn't too bad, but nothing beats an SLR for action.